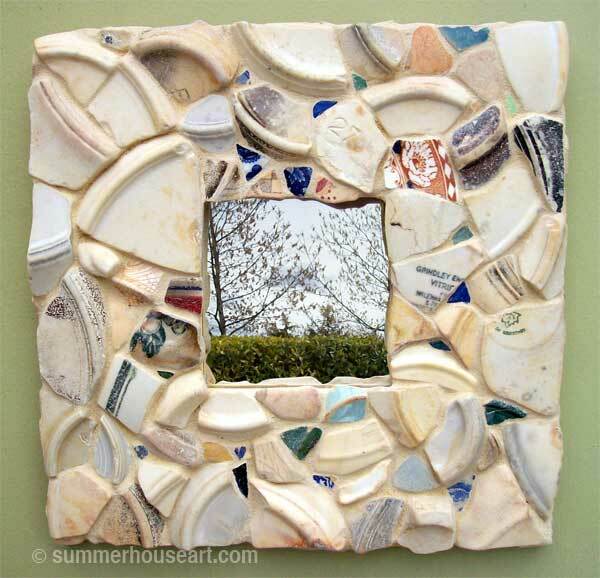 A month ago, picking through all my bits of ocean tumbled pottery, I’d started a new pique assiette mosaic mirror. You would think that picking bits from the exact same basin of shards, I would come up with almost the exact same mirror frame that I’d created back in January. That was when I’d first started experimenting with these smooth, aged and beach sanded shards. And maybe, I might have. 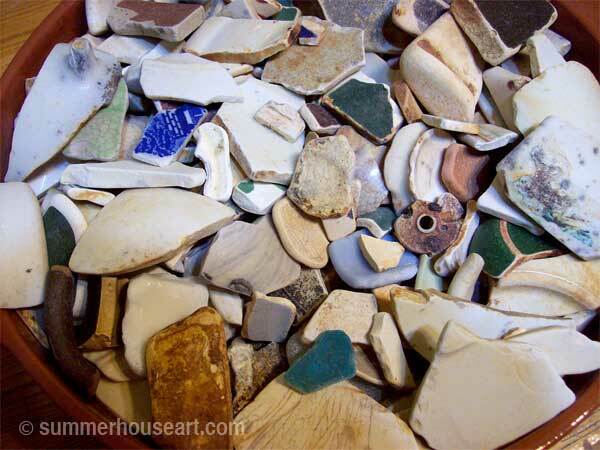 But as I was arranging shards, I found myself attracted to the lighter pieces, the undersides of plates, the curves and how they created a pattern and a movement. Stealing time here and there from other things, I finally got to the stage of grouting last Friday. 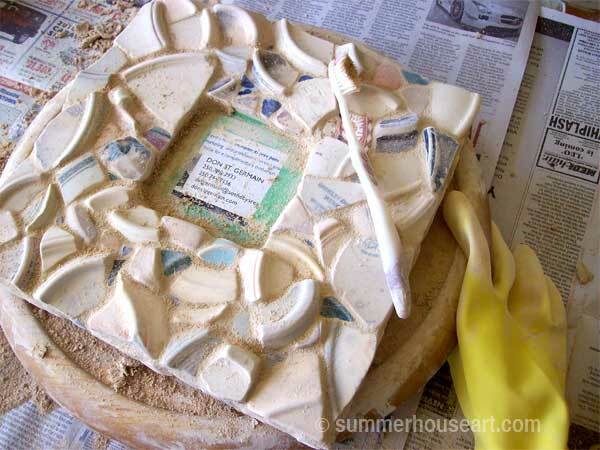 And accompanied by the soundtrack to “Monsoon Wedding” CD, ( another lucky garage sale find), mixed up a a couple of different grouts until I got a shade to my liking and grouted it up. BTW, if you have never seen Monsoon Wedding I’d highly recommend it. The movie is colorful, lively and has great music…..but at the end, for all of us mosaic lovers, there is a wedding scene in a mosaic covered grotto. 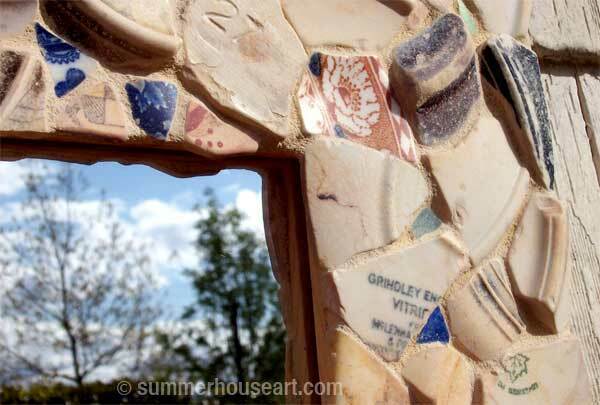 I just kept playing that scene over and over trying to take in the mosaics. And yes that is an old toothbrush, that I’m using to clean off grout. And you thought there wasn’t another use for them. I was struck by the contrasting frames that I’d created with almost the same ingredients. All the result of my choices from the pool of shards. I couldn’t resist hanging them side by side to enjoy the contrast. 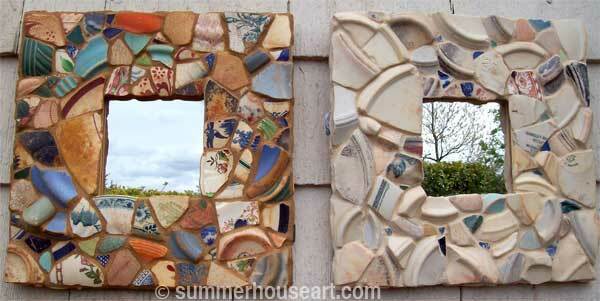 The first mirror is a collage of all of the rusty and patterned pieces. The second mirror frame is a quiet, almost monochromatic arrangement, with the movement created by the curves as the central theme. Of course, I did add a few little detailed pieces to break up the surface and add interest. In the header of this post, if you look carefully, you will find the tiniest little blue heart. In this corner you will find the few special bits I loved and a found space for, like the floral shard of some long ago shattered tea cup or a remnant of the manufacturers mark on the bottom of the dish. And here it is, up close and personal, on a more pleasing background to highlight it’s quiet colors. I’m quite happy with it. 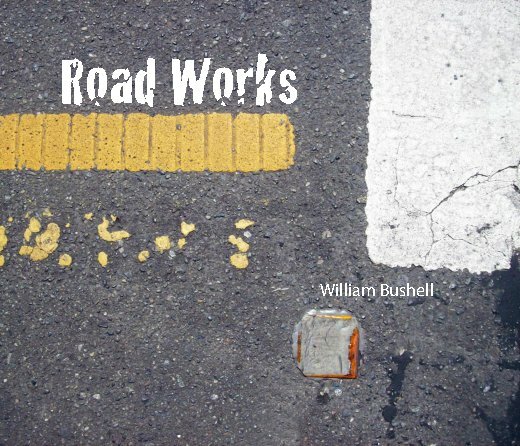 It’s a bit of a departure for me too, the artist who likes bright and gaudy, don’t you think?